Before spending money on a treatment, growers will need to identify the cause. The Canola Diagnostic Tool can help you work through the possibilities. A few localized tests can also help with the diagnosis…. 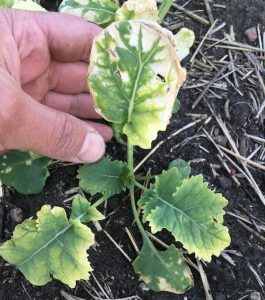 By this stage of the season, flea beetle and cutworm risks are lower because crops are bigger and these two insects are in natural seasonal decline. Adult flea beetles have laid their eggs and are dying. Cutworms are pupating. We’re now moving toward sweep net timing for lygus and cabbage seedpod weevil. 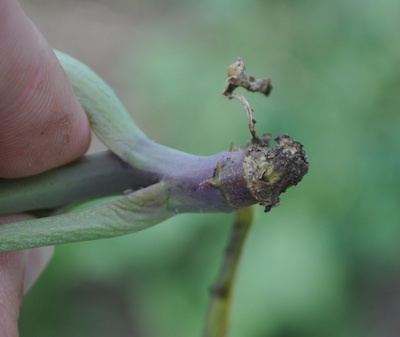 If you would like a field tested for clubroot as part of the Ministry’s survey please email pestsurveys@gov.sk.ca with your name, phone number, RM and Legal Land Location. Keys to the spray decision are scouting and timing. The economic threshold is 20 CSPW per 10 sweeps generally across the field. 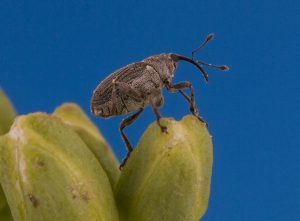 If weevils are at thresholds, the time to spray is at 10-20% bloom, just as first pods reach 3/4” long. Cabbage seedpod weevil and lygus thresholds are based on sweep net counts. Here are three videos that can help with scouting and sweep-netting tips for cabbage seedpod weevil and lygus. General wilting is likely environmental, but patches or individual plants could have some other cause. 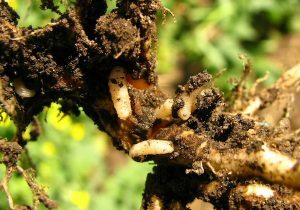 Dig them up carefully and look at their roots for clubroot galls, root diseases and cabbage root maggots. If you see dying plants or plants with lower leaves dying off while other plants remain green, this may indicate abnormal root function. Heat, drought, off-label herbicide applications, male sterility, insects, sulphur deficiency, boron deficiency. The later hail occurs, the higher the chance of yield loss, given that the plants have less time to recover. Second applications applied late can reduce profitability it two ways: A competitive crop growing ahead of the weeds may not need a second application. A late application can cause a surprising level of hidden damage to canola plants, setting back yield potential.